Mac Miller has announced the title of his upcoming sophomore album. Taking to Twitter, the Rostrum Records signee revealed that the follow up to last year’s Blue Slide Park will be titled Watching Movies With the Sound Off. He also said that the project is expected to impact in early 2013. The Pittsburgh, Pennsylvania rapper also said that his collaborative EP with Pharrell Williams, Pink Slime, will be out by the end of the year. 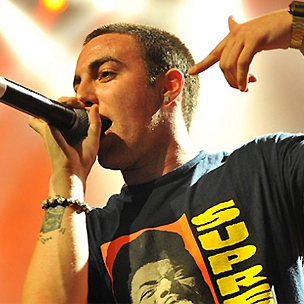 “[I]’m doing a lot of production on Watching Movies,” wrote Mac, who said that the title was inspired by his work with Big Jerm. Mac’s debut Blue Slide Park hit stores in Novmeber 2011. The LP debuted atop the Billboard 200 with 145,000 copies sold, making it the first independently-distributed album to top the charts since 1995.
pink slime will be out before the end of the year. and Watching Movies will be out early next year.